As the seasons change from fall to winter, your skin care regime should change as well, including some TLC for your face, arms and legs…basically, your entire body! In the winter, it's not just your face and hands that need a little extra attention. Consider taking the time during your daily shower to cleanse and soften the body with Glytone Exfoliating Body Wash which is designed to cleanse and soften while providing the exfoliating and revitalizing benefits of 8.8% Glycolic acid concentrate. Think of your body like a tree, covered in a layer of protective bark, and when you shower, your body cleansing should involve polishing away the oldest and loosest skin cells to reveal the living cells underneath. This allows the freshly exfoliated skin to absorb the benefits of emollients when you slather on your moisturizing body lotion or cream. Gentle, yet effective, this amazingly cleansing body wash removes excess oils, debris and dirt, leaving the body feeling fresh and rejuvenated. This unique gentle exfoliating wash softly helps in shedding old skin cells and awakening a rejuvenated new skin layer! Skin is radiant, soft and healthy. And speaking of moisturizing your body, it only makes sense to follow your a daily and diligent Glytone exfoliating regime with the Glytone Exfoliating Body Lotion. This richly-nourishing body lotion is especially formulated to moisturize and correct skin texture imperfections on the body, while softening and smoothing to reveal younger, more vibrant looking skin. Basic cleaning: Even dead skin needs a regular bath. If you leave your dry skin cells undisturbed, it will mix with sweat and dirt to form a very open platform for bacteria to live on your skin. Keeping up with a basic cleaning ritual is paramount for your best body skin. Moisturizing: Ordinary soaps are harsh and drying. They strip away the natural oils in your skin. Unfortunately, this dry skin loses its natural protection against bacteria, which can then slip in through cracks and fissures in your skin. To keep your defenses up, rub lotion on your hands when they become dry (for many people, that means after every washing), and use gentle cleansers on other parts of your body (like your face). Exfoliation: Some people swear by special scrubs and brushes for removing dead skin cells. While exfoliation may improve the feel of your skin and temporarily enhance its appearance, over exfoliation can cause you to end up with dry, inflamed skin. So if you’re an exfoliating junkie, limit your sessions to twice a week, and moisturize your skin to replace the natural oils you’ve just scrubbed away. 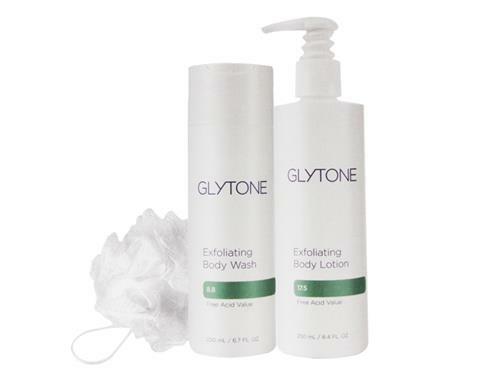 The Glytone KP Kit contains the Exfoliating Body Wash and Exfoliating Body Lotion, as well as a body pouf. It utilizes the benefits of Free Glycolic Acid to help reduce specific skin conditions, such as Keratosis Pilaris, red bumps, and rough, bumpy skin. Great for keratotic or dry skin. Feel fresh and scrubbed with the entire line of Glytone products just in time for the Holiday Season!